Looking for Hotels near the Kelvin Hall? The Kelvin Hall is an imposing Glasgow landmark on the banks of the River Kelvin in the West End of the city. The building dates from 1927 and has been used over the years for a variety of purposes; as a music hall, barrage balloon factory and it housed the Glasgow Museum of Transport until 2010. 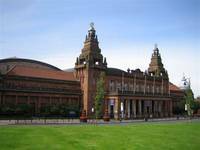 It is currently home to the Kelvin Hall International Sports Arena and is operated by Glasgow City Council. The International Sports Arena hosts many sporting events including badminton, boxing and volleyball tournaments. It hosted the 1990 European Athletics Indoor Championships and is the home arena of the Scottish Rocks basketball team. There is also a Sports Injury Clinic within the confines of the building. The arena is open to the public and offers fitness classes, a free-weights area and more than 50 gym machines. It is also possible to hire rooms at The Kelvin Hall for private or corporate functions, seminars and conferences. The venue is very well serviced by public transport and the surrounding area has plenty of restaurants, bars and other forms of entertainment. If you are in need of accommodation near The Kelvin Hall, The Sandyford Hotel on Sauchiehall Street close to the West End and the City Centre of Glasgow is a perfect choice. We offer our guests a range of services including bed and breakfast accommodation with full Scottish breakfast, free Wi-Fi in every one of our 55 rooms and 24 hour reception. The B&B packages are cheap, but there is no compromising when it comes to the quality of the furnishings and the warm welcome we extend to our visitors. To make a reservation at The Sandyford Hotel, simply call us on (+44) 0141 334 0000. We will be happy to advise you on available rooms at affordable rates. You can make a booking by filling out the booking form available on this website. Contact The Sandyford Hotel today to book your hotel in Glasgow near The Kelvin Hall.